I was able to get my gmail address very early on - it is just my lastname@gmail.com. People use my address to sign up for all sorts of things - car rentals, apartment repairs, pizza orders, dating sites, etc. You are just afraid I will sign you up for those Chinese dating sites. Last week I received mail that my new Paypal account was ready, address on the Netherland Antilles. Huh? 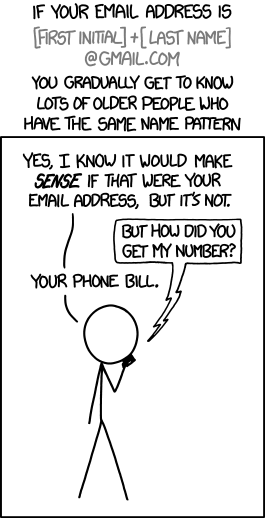 Already have a PP account for ages and it is not connected to the mailaddress that received the mail (firstname.lastname@gmail.com, yes, you can figure it out ;) ). Then a creditcard got conected (not one of my CC's though). A day later the account was closed. I think the owner finally figured out why he did not have access to the mail address (maybe because I changed the password, LOL! ).